Bible Cartoons: Matthew 09 - Jesus heals by faith - Scene 07 - Do you believe? Bible Cartoon: Matthew 09 - Jesus heals by faith - Scene 07 - Do you believe? 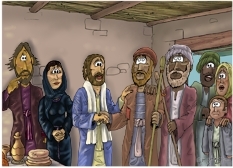 From left to right: Matthew/Levi, Mary Magdalene, Jesus, two blind men, an unnamed family (husband, wife & little boy) in the doorway. This scene is set just after Jesus has left the synagogue rulers house, having there resurrected his daughter from death (See Matthew 09:18-26). It is also the second in the series depicting Jesus’ healing of 2 blind men. 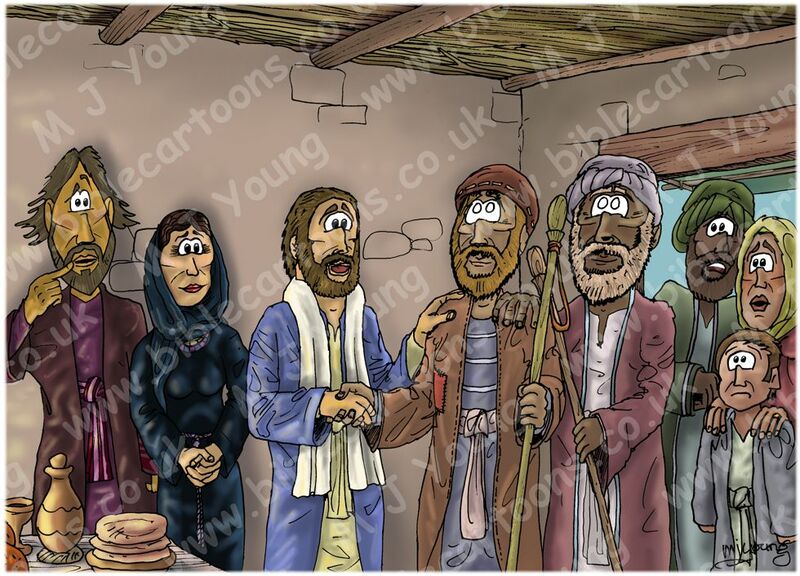 In this scene the two men have walked into the house where Jesus was staying. You can see Jesus (in blue, with a white head scarf) shaking hands with one of the blind men. Jesus seems to have wanted to determine the level of the two blind men’s faith, hence his question “Do you believe I can make you see?” They respond with an emphatic “Yes Lord, we do”. With faith like that to work with Jesus can do anything! The use of the word “Lord” reveals that these two men had faith in Jesus’ power and authority to heal them, but also that they considered Jesus to be God; they acknowledged Jesus as Messiah.